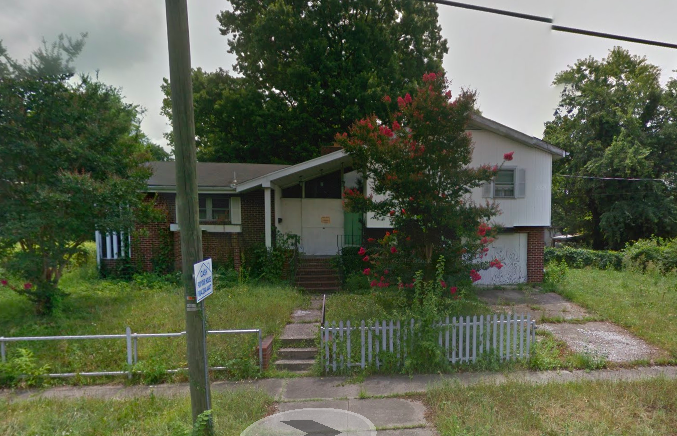 The house at 1007 North 33rd Street, built in 1962 and once one of our “100 Vacant Houses”, sold at tax auction in late 2016. The house has been renovated and is now for sale for $389,000. This house screams “1960s” and doesn’t match others around it. That said, they did an excellent job with what they had to work with — about the best they could do, short of tearing it down. The “after” photo reminds me of a smaller Brady Bunch house. That is a good looking mid-century house. They did a really nice job on it. What a cool renovation!!!! Glad to see something happen with this place it was vacant for so long. Yes, it is not period to the neighborhood but was done before the area was under various historical designations and regulations. That said, yes… I too love this house! GASP… Huffstutler likes something other than 19th century architecture!?!? Yes, I do…as long as it is correctly done like this house. Excellent renovation. Objectively well done exterior. Looks sharp. Will probably be eligible for the national register once the mid-century standards are in place. Superlative house! Eric likes something?! Shocking!!! I kid, I kid! @11 mary, do you know something I don’t about mid century listings and our national historical neighborhood registries? @12 JessOfRVA Yes, I do! 🙂 I am not a bad person nor hard to get along with. My emails may come across that way since I write concisely and try to get to the facts quickly. Probably from all the years working at a law firm where details and time mattered and so, communications were too the point. I do like well executed mid century modern and so like this renovation. They stuck to that period rather than coming up with some off the wall Frankenbuilding design that has no place in historic neighborhoods. It must have been an early replacement during the Urban Redevelopment era in that area? #13 – I know nothing about mid-century structures as regards “our national historical neighborhood registries?”….but from a CAR quarterly business meeting I attended a couple of years ago I learned that acceptance of them individually was in the works (long overdue)….and may already be in effect. @14 Lanny, historic neighborhoods are small areas within a city – only a few blocks. They are unique and as with any antiquity, needs to be preserved. The O&H as well as National Parks guidelines, were set into place so not to destroy the historic fabric of a neighborhood, especially with new infills. Take for example, if a 19th century master painting of a street scene was damaged with a portion missing. Instead of restoring it to the way it was, someone puts automobiles on the streets instead of horses and it loses its value in many ways. If mid-century houses were already on a lot before these historic regulations were in place, then I am all for them being restored – if restored the way it looked when originally built…like this house above. But per the guidelines, all structure, including infill, should reflect the period of architecture that surrounds it. Not like the piece of crap double house put up at 21st and Broad that does not follow any of the rules, and was slipped in under our noses basically due to conflict of interest within the CAR. Right now, mid century is only 60 years old and were even younger than that when neighborhoods were registered. Even by definition, an “antique” needs to be at least 100 years old. Most of the houses under the current districts are at least 100 years old minimum, with a majority actually 130-170 years old and a few even older, like our house (208 years old). Oh, Mr. Huffstutler, I don’t know much about our national historical neighborhood registries because I don’t care to know much about our national historical neighborhood registries. As for the link, I figured out its purpose before I linked it…which I did, with the comment “There’s a lot online. I should have quit with that statement. 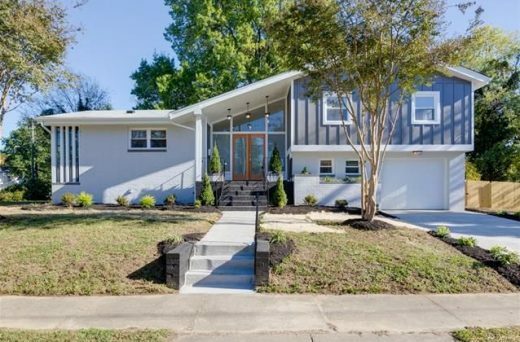 My initial comment was to the effect that the house on 33rd – this stunning example of a modern home – “Will probably be eligible for the national register once the mid-century standards are in place.” Obviously the standards are in place and I stand by the statement. @17 mary… then, you need to take the time and learn about them, especially if you own a home in Church Hill or other surrounding historical registered neighborhoods. The example you gave was not even in the state, let alone city. And sure it was not a home in a compacted neighborhood like ours? Or one cited as the most concentrated examples of 19th century architecture in America, like ours? I can say from knowledge that if you work on your home (external alterations) without the CAR being involved (who enforces the O&H regulations), then you are making a big mistake and if the designs do not conform and you do not comply, or try and do the work under the city’s noses without it being inspected, they have the right by city code to condemn and evict you from your home if they wish. There are legal city codes on the book about preservation. There are generations of people who fought long and hard to maintain the look of our historic neighborhoods and and created rules to make sure it stays that way. But all of this is old news and something people who chose to move into a historic neighborhood, accepts the stewardship with the purchase of their home. @17 mary, and as I said before, I am not opposed to, and sure no one else is, having mid-century homes included but is there an equivalent DHR number and a PIF file associated with the history of the house as well as why it was determined “historical” to be inclusive on a National Registry approved by the NPS besides what was mentioned in the article? I would be interested in reading about their reasoning since it seems to fall outside of their usual criteria for age. “However, getting the government to see what he saw took a lot of time and a lot patience.